Star Wars Steampunk Universe is a charity support group based in Southern California which takes part in charities and events in southern California. They do crossover events with other charity groups. 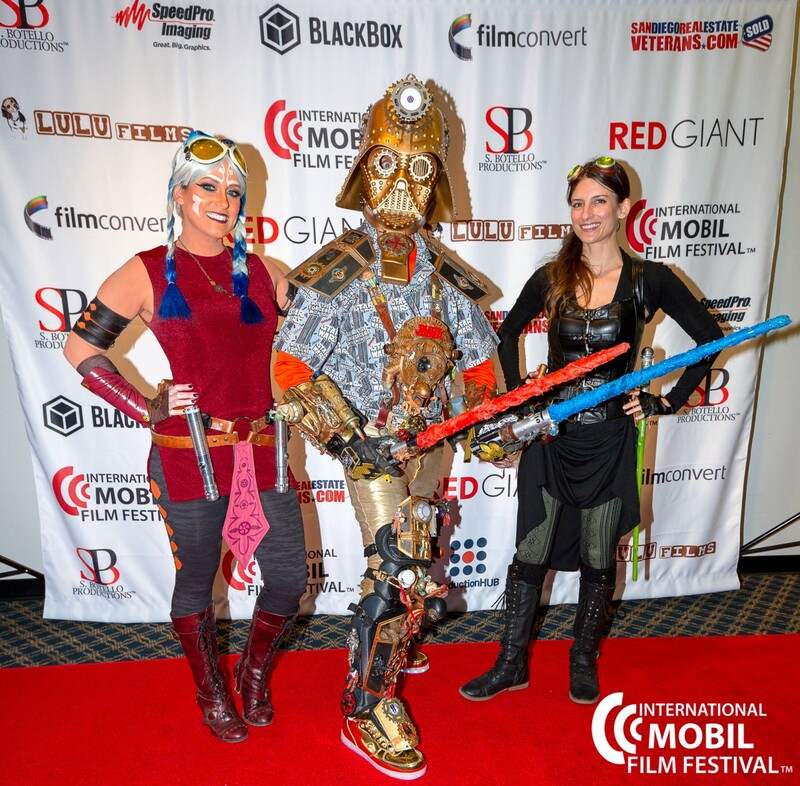 Two of the founding members of the Star Wars Steampunk Universe are our guests in Episode 52 of the SBP Podcast Mobile Filmmaking. Download and listen to Episode 52 of the SBP Podcast Mobile Filmmaking wherever, whenever and however you wish. 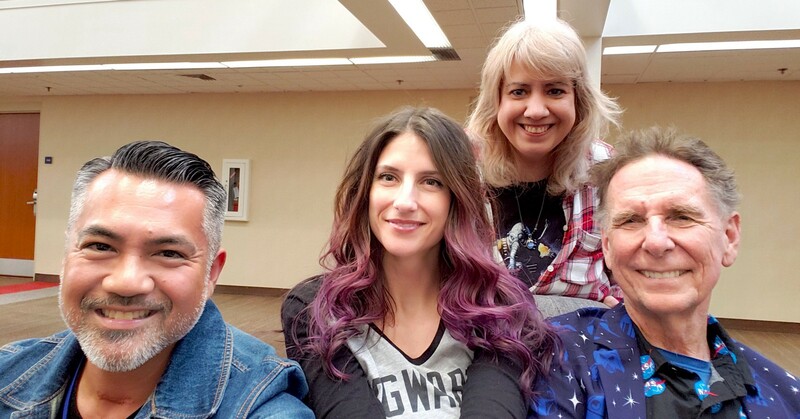 Founders of the group, who are still active participants, are Dude Vader (Chris), Captain Solo Seekerman (Nathan Seekerman), Hot Nerd Girl (Tracy), Kansas City Photography (Kansas Johnson), Lando Chronos / Family Goals Cosplay (James) and DLo Cosplay (Shaylor). They’ve added many more members to their group over the years. Chris emphasized they are not a cosplay group but a charity support group for Southern California and is specific to Star Wars. He mentions the Sci-Fi Coalition as one of the main groups they team up with and how they “do every version of cosplay you can think of.” Chris mentioned he is a part of about 100 events a year and 80 or so, of them, are charity. The group caught the eye of Lucas Film when they teamed up for a panel at Star Wars Celebration Anaheim in 2015. They soon began to form the Star Wars Steampunk Universe and their debut as a group was at the San Diego Comic-Con International in 2016 where they received an award as the Best Costume Group from the Hollywood Costume Designer’s Guild. Chris plays Dude Vader which is a steampunk version of Darth Vader and Tracy “Hot Nerd Girl” plays Sabe Sprocket, a steampunk version of Queen Amidala’s bodyguard. The group is able to get creative with their Star Wars character outfits thanks to encouragement from Lucas Film and Disney. 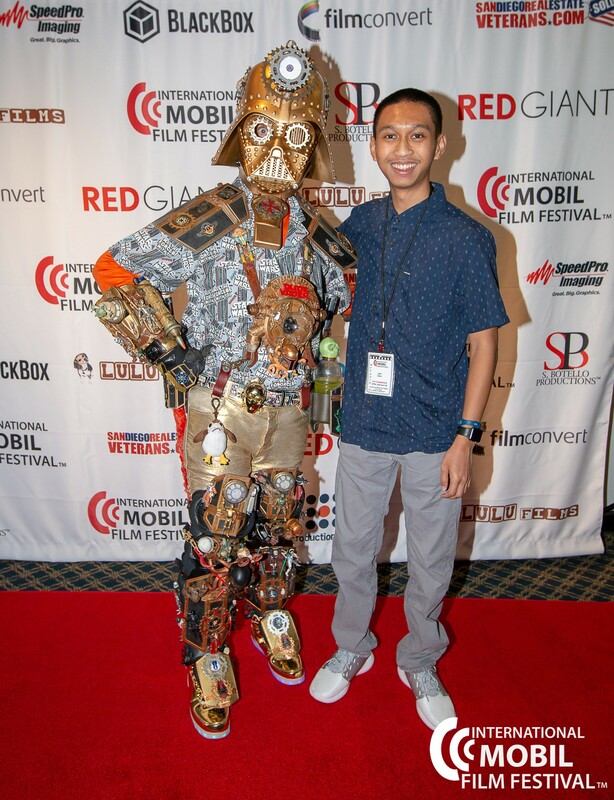 Dude Vader escorts IMFF 2018 Filmmaker Seth Dacio from San Diego on the red carpet. We asked Tracy where the name “Hot Nerd Girl” came from. Tracy shares the story including her blog and social media following on Facebook of around 70 thousand. 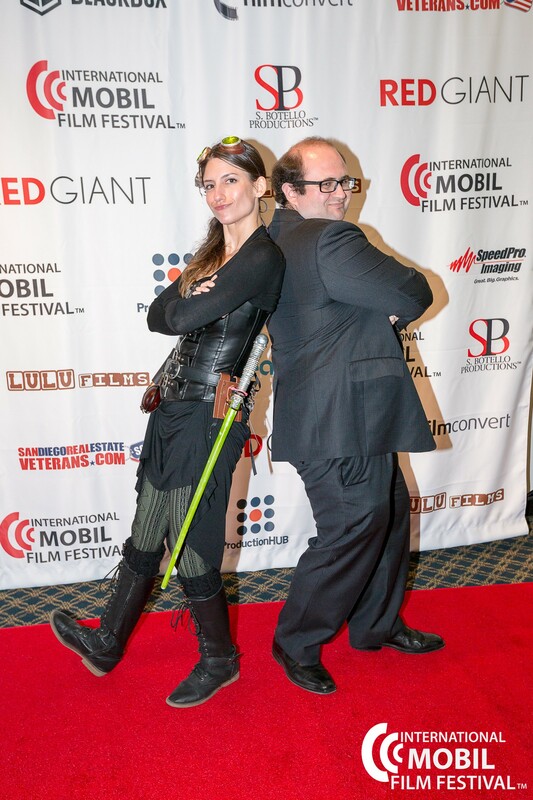 Sabe Sprocket escorts Chuck Copeland from Canada on the red carpet during IMFF2018. The story about this group is very interesting and their insights are intriguing. Chris and Tracy share many names from the history of their group and their current story. They were a part of the world premier of “Star Wars: The Force Awakens” in Hollywood and they shared an emotional moment during the film screening with their group with Nathan Seekerman who plays Captain Solo Seekerman. One thing we spoke about was how being behind a mask can help them deal with emotional situations during events as a charity. There is a similarity in documentary filmmaking behind the camera. Of course, we spoke about the importance of the red carpet for film festivals including what happens on our red carpet. 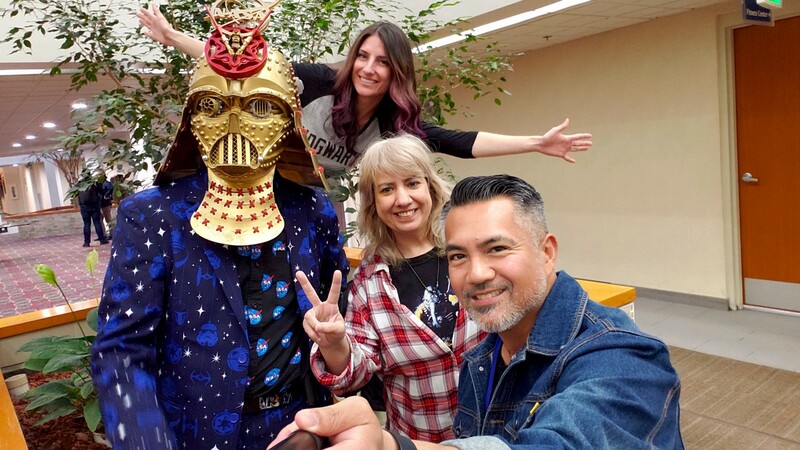 At around 42 minutes into the podcast, Chris and Tracy speak about how and why cosplayers should make films using their smartphones. 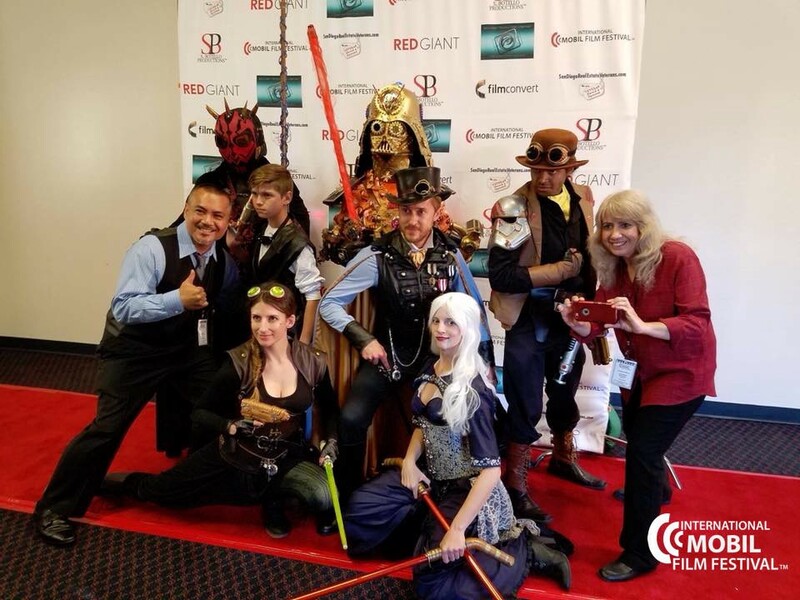 We had one of the funnest shout outs to the sponsors for #MFF2019SanDiego: Red Giant, Film Convert, Hall H Show Podcast, Star Wars Steampunk Universe, and Grip & Shoot. We also gave a special shoutout to Swords and Circuitry Studios and Uncharted Regions’ Neal and Jana Hallford. This podcast is a little longer than usual but you’ll want to stay through to the end…if anything, for pure entertainment.